These capsules, THYROID 130, (90 capsules per bottle, take 1-2 a day) contain 130 mg of dried (desiccated and lyophilized) raw (not an extract), pure bovine (beef) thyroid gland. This product is from a world leader in glandular products, Priority One Nutritional Supplements. Our best selling product, THYROID COMPLEX, stimulates and supports the thyroid gland to make thyroid hormone. Some people with low thyroid (hypothyroid) have thyroid glands which cannot make thyroid hormone, or they have had their thyroid glands irradiated, or even removed. 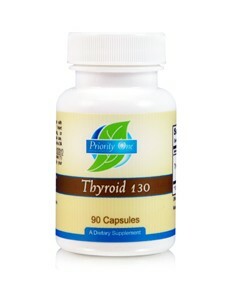 * THYROID 130 contains 130 mg of raw bovine thyroid glandular concentrate. Each capsule contains: 130 mg of Raw Bovine Thyroid Concentrate (not an extract). Tissues are processed by low temperature lyophilization to ensure and preserve natural constituents. Other Ingredients: rice chelate (drying agent), capsule (gelatin, purified water). Free of: gluten, yeast, wheat, corn, soy, dairy, sugar, starch, artificial coloring or flavoring. This product is from a world leader in nutritional supplements, Priority One Nutritional Supplements. All of the animals used in the processing are range fed cattle on grass, fed no hormones, and no pesticides, or insecticides are present during growth. They would be considered to be "organic" types as to their method of growth. The animals from which the materials are processed were not fed with ruminant-origin proteins. Priority One ( http://tinyurl.com/l47m9jd ) thyroid is sourced from New Zealand. WARNINGS: Pregnant, or nursing mothers should consult a physician before using any dietary supplements. Keep out of the reach of children. Store in a cool dry place.